Statue Of Liberty's Lights Went Dark — 'Likely' Due to Recent Work, Official Says : The Two-Way The darkness on Liberty Island dramatically changed the look of one of the country's most iconic monuments and led to speculation over the cause. 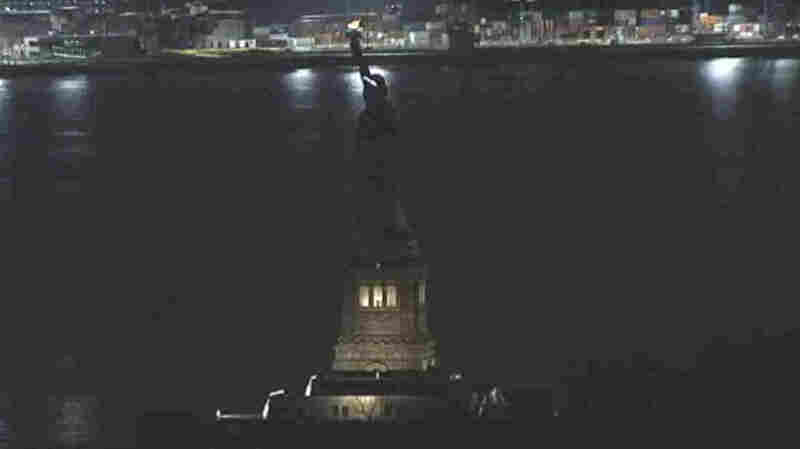 The Statue of Liberty was in the dark for more than an hour Tuesday night, as this still image taken from video shows. A National Park Service official says the unplanned outage was likely because of work on a backup generator. Spotlights that illuminate the Statue of Liberty in New York Harbor went dark for more than an hour Tuesday night, prompting speculation over the cause: Was it to do with a protest on International Women's Day, or perhaps America's immigration policies? A National Park Service official says they're still looking into it, but they suspect recent work on the electrical system is the cause. "The outage was most likely due to work related to an ongoing project to activate a new emergency backup generator which is part of our last remaining Hurricane Sandy recovery projects," the NPS says. It added that the outage was "unplanned." The darkness on Liberty Island dramatically changed the look of one of the country's most iconic monuments — and as an AP video shows, when the lights came back on, the effect was striking. Much of the reaction to the outage focused on the timing: Lady Liberty's lights went dark on the eve of A Day Without A Woman, a strike that a coalition of groups have planned for Wednesday. One of the groups, Women's March, tweeted, "Thank you Lady Liberty for standing with the resistance and going dark for #DayWithoutAWoman." Some who read the park service's explanation replied with a wink — literally posting videos of women winking in reply to the NPS tweet. Others said the explanation of a power outage only served to cement the link between the monument's brief time out of the spotlight and women's circumstances in today's world. Coinciding with International Women's Day, today's organized protest "aims to highlight the economic power of women — as well as ongoing problems of discrimination and pay disparity," as NPR reported this morning. The park service said it wouldn't know the cause of the outage until crews get back to work Wednesday. The agency cited an ongoing project involving "a new emergency backup generator which is part of our last remaining Hurricane Sandy recovery projects" — a project that involved hoisting the generator high enough to avoid potential floodwaters.